It sure has been a very busy Spring. I would first like to apologize for not posting for the last three weeks. Days just seem to be getting longer and longer, both with sunlight and work load. 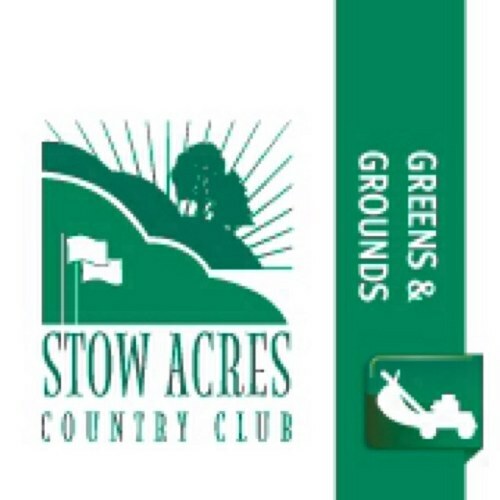 If you are playing Stow Acres consistently, then you are definitely noticing the courses beginning to take shape. We officially have 25 days until the Junior PGA tees off on the North course, and we are extremely excited! With the tournament in mind, we have made some changes to the North for both aesthetics and playability. First, I would like to comment on the naturalized areas around some of the green and tee complexes. We have decided to allow those to grow up and in. These areas are consisted of mostly fescue grasses, and most will grow to about 2 feet in height and take on a very wispy look. We have made some changes to the left side of the 5th greens complex and to the right side of the 6th greens complex. The changes include repairs to the cart paths, removal of trees, adding good soil, and repairing bare areas with new sod or rescued sod from our golf school short game area. Secondly, two of our biggest but subtle changes have been to the rough (mainly green surrounds) and to the greens. A lot of behind the scenes work has gone into the greens this year getting them ready to play fast come tournament time. Factors such as height variation, consistent rolling, grooming, topdressing, and selected product usage has helped us to build a turf grass plant ready to get beat up! Provided weather is cooperating, the greens are currently rolling a consistent 10.5, and some days, 11. We plan to have the greens rolling around 11.5 or 12 for the tournament. The rough has been noticeably thicker as the Spring season progresses. This is due largely to the amount of fertilizer that we have been applying. In order to handle an errant approach shot, the green must be surrounded by thick and healthy rough. It is currently being maintained at a height of 3 inches. We plan to keep it this way and potentially increase the height to 3 1/2″ as the tournament nears. Other miscellaneous tasks are being completed and are ongoing such as edging bunkers, adding bunker sand, raking tree groves and fescue areas, and of course fixing fairway spots. We still have some changes to make, but we are just about ready for July 12th. Please stay tuned, as we begin to accelerate into an extremely busy 25-day count down. It will sure be fun! I almost forgot…the U.S. Open begins tomorrow at Pebble Beach. From what I hear, the Superintendent and his staff have done an exceptional job in preparing for the event. We are fortunate enough that an author from Golf Course Management magazine is blogging from Pebble Beach this week and is following the maintenance staff, as to provide some insight behind the scenes. Please click on this link to see pictures and read about course maintenance preparations (http://gcm.typepad.com/)! See you on the course!